The PSP market is a consolidated one, led by a few key players that are rapidly growing and expanding globally, while local players are finding a niche and adapting themselves to cater to particular areas. The two groups have to operate under different strategies in order to be successful. Despite its consolidation, the market is still the playing field of a large number of players, so it could be pretty daunting to try to gain insights into the whole ecosystem. Therefore, we have decided to publish a comprehensive overview of the PSP space, in order for our readers to have a better understanding of the intricacies of the market and the players that it contains. We have conducted an in-depth analysis of the key global, international, and regional players, and mapped them accordingly based on several core variables. On top of this, the findings of our research are accompanied by a glossary of the jargon and terms used in the above-mentioned industry. 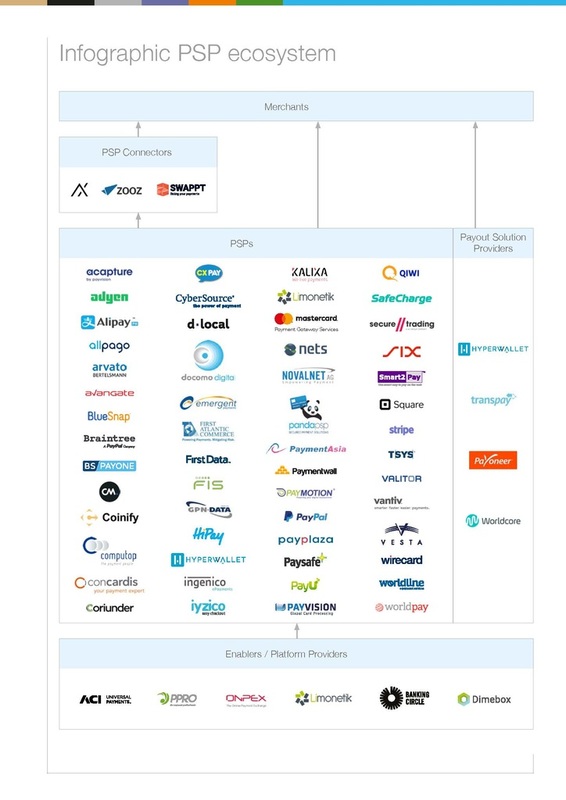 For the purpose of this Guide, we have distinguished four categories of companies offering PSP solutions: the PSPs, the Payout Solution Providers, the PSP Enablers, and the PSP connectors (see Infographic PSP ecosystem). A single technical connection for all the payment methods that are offered to the consumer on the web. Access to local payment methods in defined countries. A single administrative connection (reporting). A single settlement procedure with an agreed frequency. 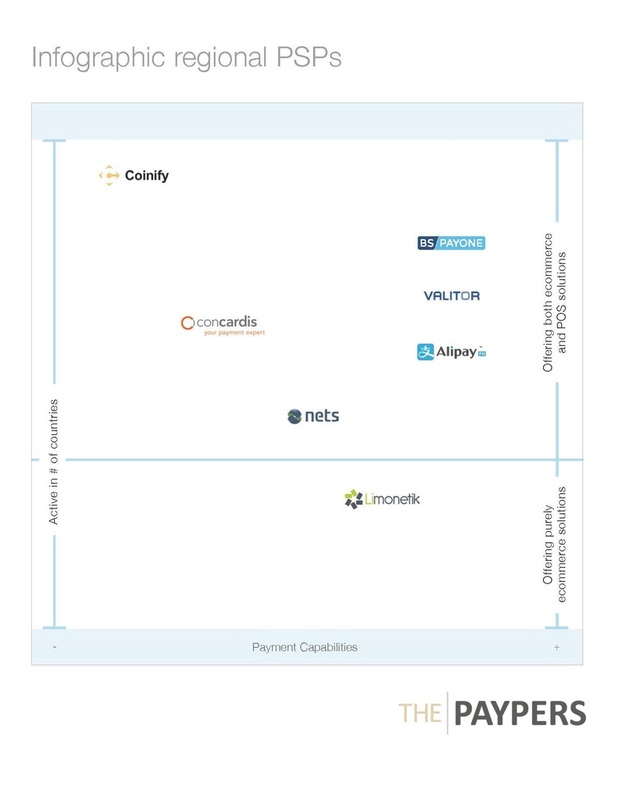 Usually fewer contracts are needed, compared to having individual connections to acquirers. The PSP acts as the ‘super merchant’, being able to offer lower fees because of its purchasing power at the acquirers. Access to specialist knowledge concerning payment process. Payout Solution Providers are players that specialize in global mass payout solutions. They offer their services to merchants that need to pay users of their marketplace or service platform, e.g. people selling wares on a marketplace like eBay, or drivers for services like Uber or Lyft. With the help of Payout Solution Providers merchants can ensure that payments for goods or services on their platform happen reliably and consistently, e.g. if a business pays freelancers for services that are carried out in the name of the company, like Uber. This category contains two groups: players that are dedicated payout providers, like Transpay or Hyperwallet, and PSPs that offer payout solutions as part of their marketplace services, like Adyen or SafeCharge. PSP enablers are players that offer several services or capabilities to PSPs in order for them to render payment services more effectively. The services provided by PSP enablers vary from offering connections to card acquirers and APMs, to processing and collecting services for APMs, and a wide range of other value-added services, e.g. 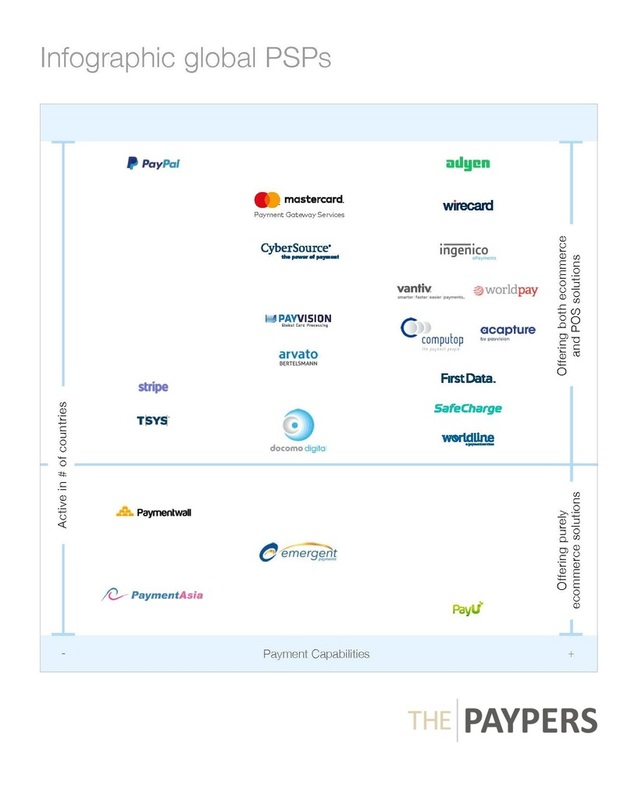 a payment account, acquiring services, et alia. The most important PSP enablers are ACI PAY.ON, PPRO, ONPEX, Limonetik, and Dimebox. PSP connectors are relatively a new breed of technology solution providers, offering merchants the option to connect (via a single API) to multiple PSPs, acquirers, and e-wallets. With that kind of solution, they help merchants optimize routing and potentially savings on cost and higher authorization rates. Important companies of this type are APEXX Fintech, Zooz and Swappt. All the PSPs in this research have been analysed based on numerous variables. At the end of report, the complete findings are published. The variables are grouped in categories, and based on a selection of variables and categories we have created the infographics. The research includes PSPs, Payout Solution Providers (which can be PSPs), PSP enablers, and PSP connectors. After the research was conducted, we selected a few key variables that define the PSPs within the ecosystem. The first variable is the degree of global or regional presence of a PSP. We have defined three distinct categories: global, international, and regional PSPs. Global PSPs have a physical presence in at least four regions (as defined in our research), three of which are North America (US), Europe, and China. International PSPs are present in at least two regions, and regional PSPs are present in one region. Based on this divide, we created three infographics, one per each group. The second key variable is the distinction between omnichannel and pure ecommerce PSPs. Omnichannel PSPs offer both online and offline solutions, while pure ecommerce PSPs offer solely the former. In all three of the infographics the PSPs are divided in two groups to signify the divide between the omnichannel and pure ecommerce PSPs. Thirdly, the PSPs are ranked on their payment capabilities on the x-axis, and the number of active countries on the y-axis. The payment capabilities variable is the sum of the payment capabilities offered by the PSP, as described in the variable list. The number of countries constitutes the countries in which a PSP supports merchants. This is not the number of countries in which a PSP can offer payments, i.e. a PSP can exclusively cater to merchants in a certain country, but accept payments from any number of countries. The results of this report have all been based on a combination of desk research conducted by our editors and the input received from our partners. Some variables remain hard to distinguish and some information provided by companies is hard to verify. Reports of transaction volume, in particular, are often incomplete, unavailable, or self-reported on part of the PSP. 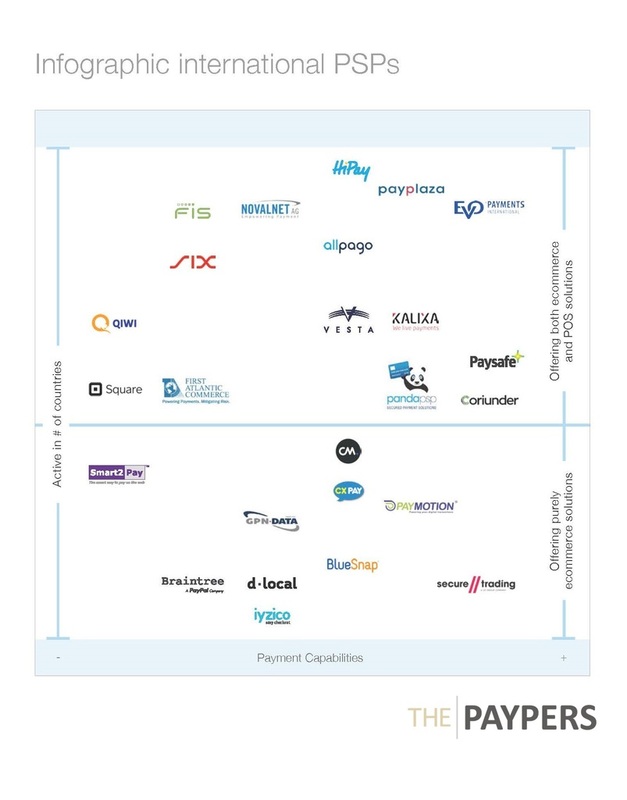 You can download the whole report, 8th edition of the Online Payments and Ecommerce Market Guide 2017, from the The Paypers' website here. Infographics on the global, international and regional PSP ecosystems can be viewed below.